Unfortunately I was taken on holiday over Easter- so inconvenient and inconsiderate of my step brother to be getting married in Australia, and invite us too stay for two weeks. Slash I loved it, obviously. However, I was too cocky when it came to jet lag. Turns out if you go back to teaching teenagers about Tennyson, merely hours after landing from a 25hour flight...well you're going to burn out. So my recovery from jet lag was horrendous, and was the reason behind me withdrawing from Rockingham OI; I was still a day-sleeper for about a fortnight, which isn't so safe when going XC. Rockingham was the only competition I was entered up for in between Belton CIC** and Tattersalls CCI**, but I managed to fit in some BSJA on a ticket, in between my naps and essay marking! We found a lovely big outdoor arena just outside of Oxford, where we had two double clears around the Newcomers and Foxhunters. Luckily I'm also based insanely close to Tweseldown, so we got in some XC schooling on the sandy ground. Aside from that, it's all been about getting his majesty fit (he's looking fab-very fit and ready to go!). We use some all-weather gallops in Bramshill, so no matter what weather we're delivered, I can still fit in my interval training. I've been warned that Tattersalls CCI** is a long course, so I wanted to be on three lots of 8 minute canters, with 3 minute walks in between. Hello everyone, it's been a while since I last wrote from my blog so I thought Spirit and I should give you another update. Over the last month or so Spirit and I have done a great deal fueled by our Simple System horse feed including a very successful demo for the Cotswold RDA Centre at the Cheltenham Racecourse for 'The Complete Horse and Rider Extravaganza'. Firstly I passed my UKCC assessment with flying colours and have completed my portfolio which I have to wait a few more weeks to receive back. Next up is practice judging in a few weeks time as would really like to take my judges exam this year if possible. The horses are all well and teaching is very busy - have also started coaching some grid and pole work sessions which I am finding fun, it just adds variety to my clients sessions as most like to have a jump as well. Super cob Bloss is enjoying her slightly easier life and looking really good for it. Not long until I will start backing my 3 yr old, Paris (pictured), before turning her away for 4 months over the winter. I am a strong believer of giving breaks when backing horses - they need time to strengthen and mature both physically and mentally. The last time I wrote, everything was going a little bit too well! The horses were on flying form and I was so excited to get my exams finished and crack on. Since then it has not been going quite so smoothly. We very sadly lost little Pickles to colic in the early hours of the 26th of April, just two weeks after his 31st Birthday. It was very sad, but he owed us nothing and we did all we could to try and make him better but without operating we didn't have any other options. He was the most amazing little pony giving me my first real taste of eventing. He was such a character and is being and will be thoroughly missed on the yard. Last weekend we headed up to Rockingham Castle for the 2* with Coco. He did a good test, apart from one mistake in the counter canter (where I didn't have him collected enough to keep his balance) and then I went wrong which didn't help. 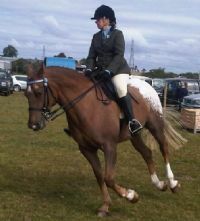 He was about half way after dressage on a score of 54.8. Then we had a very long wait until show jumping the next evening. It was causing its fair share of trouble, but Coco was so relaxed. He jumped an amazing, faultless round until the last fence, which was the third in a line of three fences on related distances down a hill. A triple bar, four strides to an upright and then 5 and a half strides to a big oxer. I collected him for 6 but he was just slightly running on down the hill and just rubbed the front rail which was a real shame.